The Brio Beardscape beard trimmer is impressive upon arrival. It comes in an a fashionable box with a stylish travel case. Along with the unit itself there are four reversible clipper heads paired together by length 1 and 2 mm, 3 and 6 mm, 9 and 12 mm and 15 and 18 mm. You will also find a USB plug in cord charging base, cleaning brush, and lubricating oil. This device is listed among the top beard trimmers on Mister Shaver. So what makes the Brio Beardscape different is the abundance of features that come directly on the trimmer. Right from the top, we're introduced to ceramic blades, paired with a gold finished titanium rake, precision ground to match perfectly. Brio touts these ceramic plates as being four times harder than stainless steel, creating less friction and heat and being quieter than metal. Moving down the unit, the Brio Beardscape comes with an integrated one millimeter to 1.9 millimeter blade height adjustment with 0.3 Millimeter height transitions in between. These are controlled with the lever lock button and micro adjust lever. Next feature is a speed control adjustment, which allows you to increase or decrease the RPM speed of the blade from 5,000 RPM to 7,000 RPM. Then an on/off button and convenient LCD display sit just below. Within the LCD you will first notice five circles at the top of the display. These show the load and the clipping head as the clipper may become clogged with hair or needle oil. And the first three circles display a load state under normal use, while if the fourth and fifth circles light up, the clipping head must be cleaned and oiled. This indicator is followed by an RPM speed and remaining charge time display based on the speed setting of the trimmer. This will show differing amounts of battery time remaining. The Brio Beardscape beard trimmer pumps with an extra large capacity lithium ion battery. It will last up to four hours based at a full three hour charge. It can be charged on the base or plugged in while in use, even if the battery's empty. 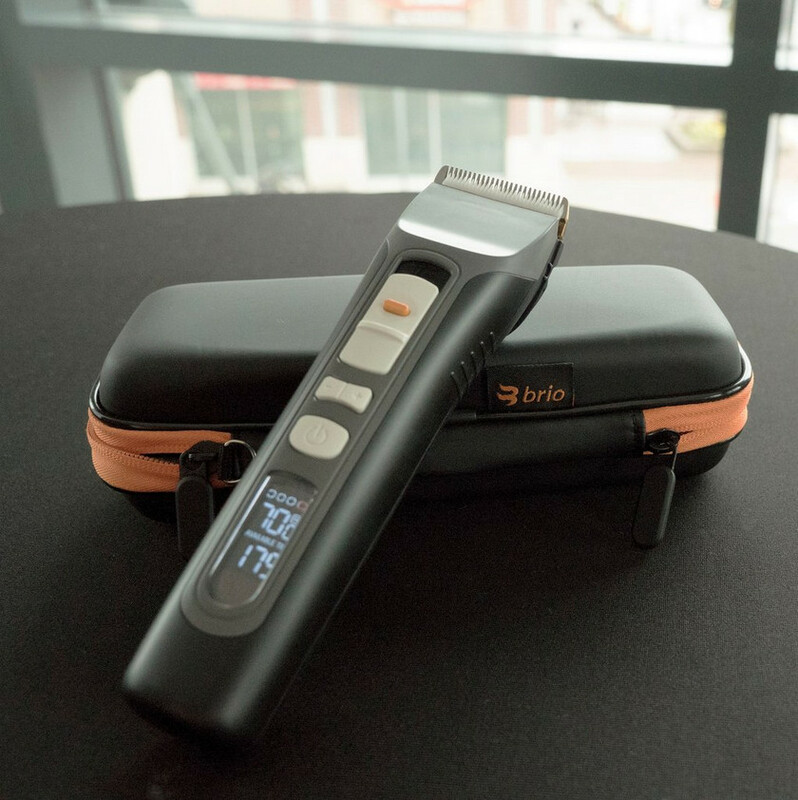 The Brio Beardscape trimmer can be used for hair, beard, and any manscaping project. It's noted by Brio to never run the blades under water because they only like oil. The cut wasn't what we expected. There's a lot of pros with this unit, but there's also a some cons in there. I did not enjoy this titanium rake, the prongs are very sharp. They're very pointy, very sharp. As far as trimming close to the skin, you can get down, but you know, it's that stubble. There is no any kind of foil shaver attachment like you'll see on a Philips Norelco Multigroom 7000 or the Wahl Lithium Ion Plus. As far as getting into really tight spaces, you can't really do it with this trimmer. It's really, it's big and clunky. The ceramic blades, yes they are sharp, but I didn't really see that much of a difference compared to whatever we used the Multigroom 7000 or the Wahl Lithium Ion, and they both get the job done. They both cut the hair. A lot of people are saying this is the quietest unit they've used. 'm going to have to disagree and this is pretty noisy as you crank up the RPM. One of the other things that I didn't like are, the way the attachments go on. They had a little nubs on inside that go into the slots on the unit and you got to try and make sure your aligned and actually finding that exact spot so that you can't pull it up. Another thing that's a little confusing, is this travel case that it comes with. What you're supposed to be able to do is slide the device on this side, take your charging cord and put it in the case, and then you take one attachment, not all of them. You pick one and it slides in the case, little confused by it. So I can't take all the attachments with me. Well that's fine, but now it's not going to close. It's going to hit into the actual trimmer unit. It's nice looking. It's solid, so it's a good case. It's just not, inside of it, I don't think it was designed as well as it could have been. And another issue which I found out is if the case gets pushed, the device turns on, which is also a problem. The Brio trimmer has the different RPM speeds down. It goes from 5,000 RPMs up to 7,000 RPMs. That's helpful if you're trying to cut into the thicker hair and you want to maintain that consistent cutting speed. As far as the display. The display is very nice, I liked that it tells you the RPMs. I like that it tells you how much time is left in minutes as well as it gives those indicators, the circle indicators at the top. It's a smart kind of technology to inform you when it needs to be cleaned or when you need to put oil on it. It also has the charging stand, which is nice. You can plug the trimmer in and you can use. It feels like it's got a good weight to it and my hand. The comb attachments are double sided so you know they're saving you space instead of having eight of these things, you only need four of them. For me personally, I don't think it's something I would continue using. I wanted it to be able to give me a little bit more precision and obviously you can't do that if it doesn't have the attachments. If you have a long beard, this is probably perfect for you. But as far as the features, I'm saying as far as the noise level, as far as getting poked with the prongs, as far as attachments going on with ease, as far as the travel case, etc.. these are just little things that I'm telling you that personally this is what I'm noticing and these are things that I don't like in the product. But I do like the speed of that it has. I like the RPMs it has. I like the digital display. They can tell me the time that's left. Once again, I'm going to go back to the Philips Norelco multigroom 7000 and the Wahl Lithium Ion plus. Right now those two are the top ones for me, for the precision on your face. They're around the same exact price. I'm not going to tell you, hey, this is the greatest product out there. Definitely not an iPhone version of the beard tommer. I didn't get that experience from it. I think it's a good product. I think it was made well, but I think some of the things could have been made a little bit better. It cuts well, it cuts sharp, but it's not what I want out of the trimmer for small type of beard.